The season's first Northern Shoveler arrived at SCMM 23 Aug (m. ob. ), with 4 birds there by 28 Aug (m. ob.). A strong total of 36 Wild Turkeys was notched along New England Road near HB 29 Aug (Jacob Cuomo). A southbound Common Loon was seen from Avalon during strong easterly winds 24 Aug (MG, DLP, TR). A boat trip to the Gull Island area found ca. 2,500 Double-crested Cormorants, 375 Great Egrets, 800 Snowy Egrets, 15 Little Blue Herons, 30 Tricolored Herons, and 25 Black-crowned Night-Herons 24 Aug (m. ob.). An evening survey of the same area produced 302 Great Egrets, 891 Snowy Egrets, 27 Little Blue Herons, and 38 Tricolored Herons 27 Aug (TJ, SWi, TR). Raptor migration was again on the light side this week, though a few Ospreys and at least 2 Bald Eagles were southbound over the Higbee Dike 29 Aug (TR et al. ), and there were multiple reports of single Broad-winged Hawks (m. ob.). The season's first Sora was noted at SCMM 26 Aug (m. ob. 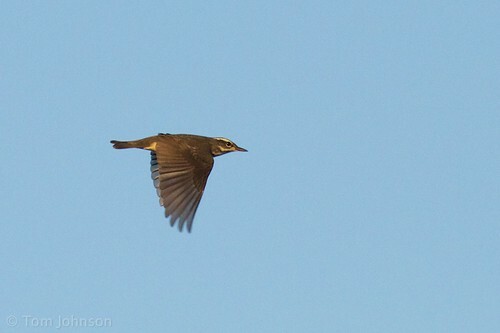 ), and the season's first Buff-breasted Sandpiper was noted at SHPt the same day (TR). At least 85 American Oystercatchers occupied Hereford Inlet this week (m. ob.). Other notable shorebirds included 7 Piping Plovers at SHPt 25 Aug (m. ob. ), and Long-billed Dowitcher at SCMM 24 Aug (LZ, MO'B) and Nummy Island 27 Aug (MO'B). Caspian Terns were easy to find at Hereford Inlet and around the Stone Harbor area-- 55 were roosting at Gull Island 24 Aug (VE, m. ob.). Gull-billed Tern will soon be gone; 1 was reported at SHPt 26 Aug (TB). Conversely, Royal Tern numbers continued to increase; e.g. 700+ were found at Hereford Inlet 26 Aug (TB). The first southbound Barn Owls were heard over North Cape May (SWh) and CMP (GD) 25 Aug. Peak movements of Common Nighthawk are fast approaching; the period's high count of 13 was notched at West Cape May on 28 Aug (MO'B). Small numbers of Ruby-throated Hummingbirds migrated past the Higbee Dike daily (GD, TR et al.). Late-August is probably the best time to locate Olive-sided Flycatcher locally-- singles were found at Cox Hall Creek WMA 24 Aug (SP) & 27 Aug (MP), and at Reed's Beach 26 Aug (TR). Solid numbers of Eastern Kingbirds continued to be found at HB, headlined by a recent high count of ca. 450 on 24 Aug (m. ob.). An excellent songbird flight over the Higbee Dike entailed 54 Blue-gray Gnatcatchers, 52 Northern Waterthrushes, 38 Black-and-white Warblers, 561 American Redstarts, and 130 Baltimore Orioles 29 Aug (TR). That same flight also included a Black-throated Gray Warbler-- Cape May County's 10th, and the 3rd seen from the Higbee Dike (TR et al.). Other notable songbirds included a Cerulean Warbler at HB 24 Aug (LW), Mourning Warbler at HB 25 Aug (LW), and Dickcissel at the Higbee Dike 24 & 27 Aug (GD). Tom Baxter (TB), Jacob Cuomo (JC), Glen Davis (GD), Vince Elia (VE), Matt Garvey (MG), Tom Johnson (TJ), David La Puma (DLP), Michael O'Brien (MO'B), Mike Pasquarello (MP), Samuel Perloff (SP), Tom Reed (TR), Scott Whittle (SWh), Sam Wilson (SWi), Linda Widdop (LW), Louise Zemaitis (LZ). *eBird. 2012. eBird: An online database of bird distribution and abundance [web application]. eBird, Cornell Lab of Ornithology, Ithaca, New York. Accessed 30 Aug 2014. Available: http://www.ebird.org. Migration through Cape May got a much-needed injection of new blood this morning, as Higbee Beach saw a pretty good morning flight - which included well over 100 Baltimore Orioles - and many locations around the point buzzed with bird activity. The rapidly disappearing specks that entertain folks at Higbee Dike may not be everyone's idea of prime birding, but it's certainly worth visiting the site on a good passage day, just for the experience of the whole adrenalin-charged show. The rush of birds was felt in the Higbee fields this morning too, and especially noticeable was the influx of Baltimore Orioles, as well as an increase in the range of warbler species flitting along the field edges. 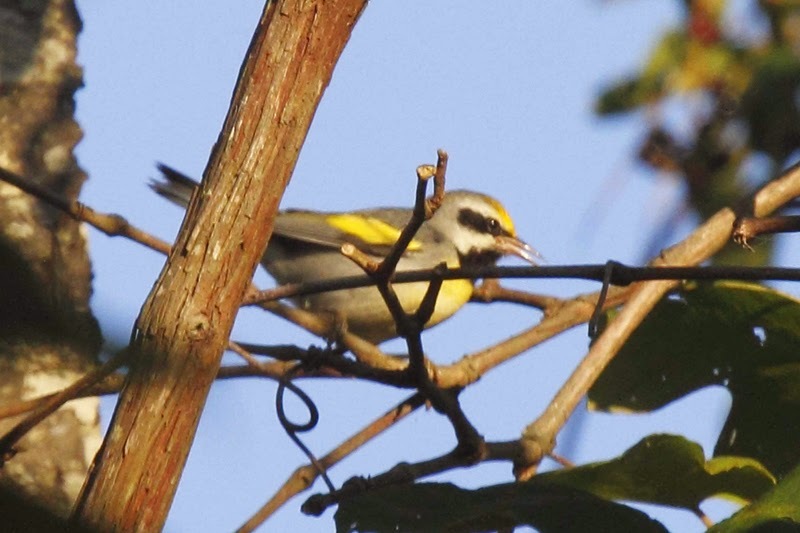 The Northwood Center is starting to attract a trickle of migrants now, with Canada and Magnolia Warblers among the expected Black-and-white Warblers and American Redstart, and a Least Flycatcher was active in the elms. Elsewhere, beaches continue to attract larger numbers of loafing gulls and terns - and more will come once disturbance tails off after this coming Labor Day weekend and tired migrants will be able to find a few quiet corners to gather up their strength for the next leg of the journey. Shorebirds moving through the backbays ensure that there is always plenty to see in the afternoons and, for those who want a really full day of birding, The Meadows provide excellent sunset fare, with this evening producing Sora, American Bittern and several Green Herons - the last two species spiralling up against a rosy sky and heading out over the bay. Then the warblers to start to pass by - here a male Cape May Warbler heads north to find suitable cover to spend the day. ....and Black-and-white Warblers creep along thicker branches like humbug nuthatches. Then of course there are the surprises - today's highlights included a movement of Common Nighthawks, several of which could be found sitting on branches at Higbee Beach and, well, not doing too good of a job in trying to look like a dead branch! It's time to head to Cape May again! After a week of very stressful north-easterlies, the weather looks set to provide us with a new suite of birds over the coming 48 hours - which should alleviate tension in the birding community at Cape May!! Despite a lack of the much hoped-for north-westerlies, there's been plenty of great birding around Cape May to keep all but the most jaded of birdwatcher happy. Wild Turkeys continue to set new all time high counts south of the canal, pre-migration heron roosts give ample opportunity to enjoy the spectacle of mass gatherings of birds, and shorebirds continue to add variety to many of our weekly walks. Tom Reed has been reporting in his weekly round-ups in this blog on the spectacular heron roost that has been readily watchable from Stone Harbor Boulevard over the past few weeks. Numbers are starting to fall away a little now as the smaller herons (Little Blues and Tricoloreds) began their southward migrations, but there's still plenty of Great and Snowy Egrets and Double-crested Cormorants to make a sunset visit worthwhile. You can view the birds coming in to roost by watching northward from the Scotch Bonnet bridge, half way along Stone Harbor Boulevard (Rt 657). Wild Turkeys continue to establish themselves firmly south of the Cape May canal. This female with two youngsters strolled casually down the road outside the Northwood Center recently, pausing to feed on Autumn-olive berries. Yes, everything is a bitter-sweet pill these days; while having turkeys around will mean fewer ticks, it will also mean that all those hideous invasive plants will be spread around more efficiently... [photo by Mike Crewe]. Last Friday saw the third, annual Pledge 2 Fledge event at Cape May Point State Park. CMBO were there, manning a membership table and running a 'Little Sit' on the Hawkwatch Platform. This latter event notched up 63 species from 3:00-6:00PM and visitors enjoyed some great birding, including this Caspian Tern that took a few spins around Bunker Pond before heading off in search of a meal at The Meadows [photo by Mike Crewe]. Also on our Pledge 2 Fledge 'Little Sit', a party of Blue-winged Teal (lower right bird) flashed around in front of us. Among their number was a Green-winged Teal (upper left bird), giving a great opportunity to compare the distinctive and very different underwing patterns of these two species [photo by Mike Crewe]. 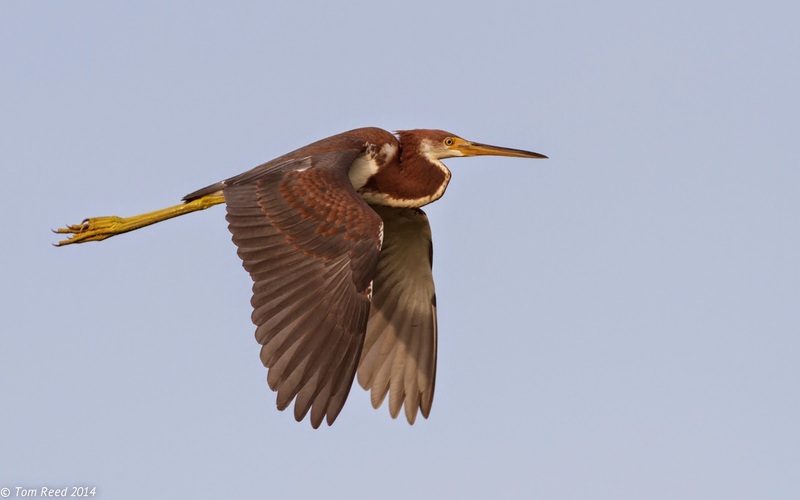 Large gatherings of birds are always spectacular and evening roost gatherings of waterbirds certainly impress. Much thanks is extended to Bob Lubberman of The Osprey for taking a bunch of us out to get more accurate counts of numbers of birds coming in to roost near Stone Harbor recently [photo by Mike Crewe]. One of these birds is not like the other ones... Getting up close to flight lines of herons and egrets going to roost allows for a better analysis of the species make-up of the flocks. Look carefully at the bird on the left and you should see black tips to the flight feathers. This bird is a juvenile Little Blue Heron and odd singles like this are easily missed among the large numbers of Snowy Egrets heading into roosts right now [photo by Mike Crewe]. The infestation of Mute Swans at CMPSP continued; a count of 40 was obtained at Bunker Pond 22 Aug (MiC, TR). The oft-mentioned, summering pack of Black Scoters remained at CMP along with at least 3 Surf Scoters (m. ob.). Unusual for the date was a female Hooded Merganser reported at Dias Creek 18 Aug (TB). A female Wild Turkey and 2 young birds continued at CMP through 21 Aug (MiC). The species was also reported along New England Road (m. ob.). Strong southeast winds were likely associated with the Cory's Shearwater seen from SHPt 21 Aug (TR). After a typical midsummer absence, Northern Gannets re-appeared in recent days, with sightings of immatures from the Higbee Dike 21 Aug (GD, TR) and SHPt 22 Aug (MG). Less expected was an adult reported from Ocean City 16 Aug (JI). Small flocks of southbound Double-crested Cormorants were reported over Cape Island with increasing frequency through the week (m. ob.). Large numbers of wading birds were noted on multiple evenings as they entered the Gull Island colony/roost near Stone Harbor. Counts conducted from Stone Harbor Boulevard produced 92 Tricolored Herons and 27 Little Blue Herons on 19 Aug (TR et al. ); 597 Great Egrets, 1081 Snowy Egrets, 39 Little Blue Herons, 86 Tricolored Herons, and 252 Glossy Ibises were recorded 20 Aug (TR, MiC, GD). Southbound Great Blue Herons are often noted during evenings with northeast winds; such was the case when 21 were flying over Stone Harbor Boulevard around sunset 19 Aug (MeC, TR). Raptor migration was unremarkable throughout the week, but 4 Broad-winged Hawks were seen over the Rea Farm/Beanery 18 Aug (TJ, MR) and a few southbound Osprey were noted most days at CMP (m. ob.). There were no noteworthy shorebird flights during the past week; a single American Golden-Plover flew over SCMM 21 Aug (TR). Water levels remained high at most sites around Cape Island, putting a dent in shorebird reports, but the Stone Harbor area enjoyed a productive week. Nummy Island held 36 'Western' Willets 22 Aug (MG), and nearby SHPt was home to 92 American Oystercatchers, 1200 Semipalmated Plovers, 130 Western Sandpipers, and 7 Piping Plovers 21 Aug (TR). The marshes and salt pannes surrounding the Wetlands Institute hosted 7 Whimbrel, 215 Red Knots, and 2 Marbled Godwits during the afternoon high tide 18 Aug (TR). Another Marbled Godwit was photographed at Jarvis Sound 20 Aug (BL et al.). Last week's American Avocet remained in the area, seen at both Jarvis Sound and SCMM through at least 20 Aug (m. ob.). A Parasitic Jaeger was attracted to a feeding flock of terns and gulls near SHPt 21 Aug (TR). Intriguing was an apparent juvenile Lesser Black-backed Gull at Sunset Beach 22 Aug (MiC); several other individuals of various ages remained on Cape Island beaches and at SHPt through the period (m. ob.). Ring-billed Gulls continued to filter in from points north and west-- weekly highs included 12 at SHPt 19 Aug (JI) and 10 at SCMM 21 Aug (LZ). Black Tern should be nearing peak southbound densities. The year's maximum to date, 14 migrated south past SHPt 21 Aug (TR). An additional 6 were reported at Sunset Beach 22 Aug (TB), and occasional singletons were found at various sites between SCMM, CMP, and the Higbee Dike (m. ob.). 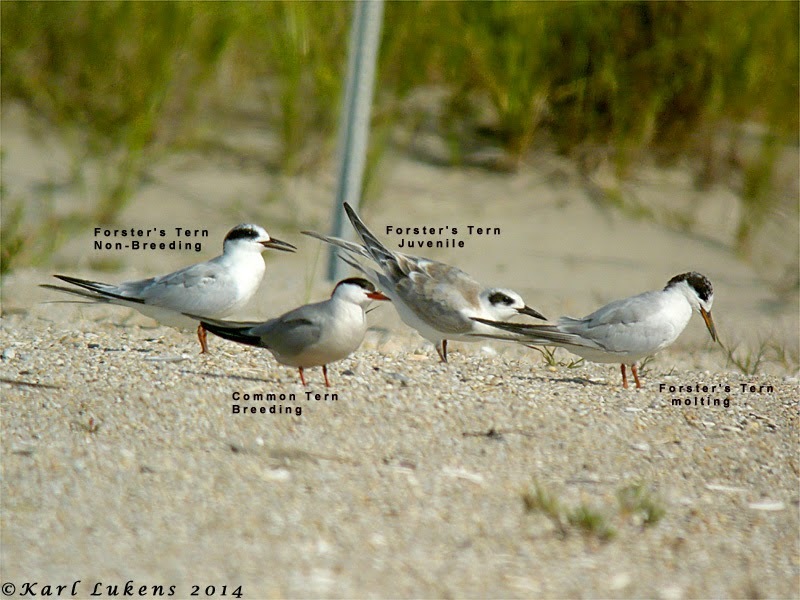 A trio of Gull-billed Terns entertained observers at SCMM 22 Aug (CH, DH), and at least 2 were seen from Stone Harbor Boulevard at Scotch Bonnet 20 Aug (TR et al.). Rare by late-Aug, a Roseate Tern tagged along with a flock of Common Terns offshore SHPt 21 Aug (TR). Royal Tern numbers increased once again, as more individuals arrived from the south. A few hundred were noted flying past Poverty Beach on at least one recent evening (CS), and 250+ were roosting at Hereford Inlet 21 Aug (TR). Beach-nesting birds endured a tough season locally, therefore a report of recently fledged Black Skimmers at Poverty Beach was especially heartening. Approximately 175 skimmers have been noted at the site in recent days (fide NJDFW). 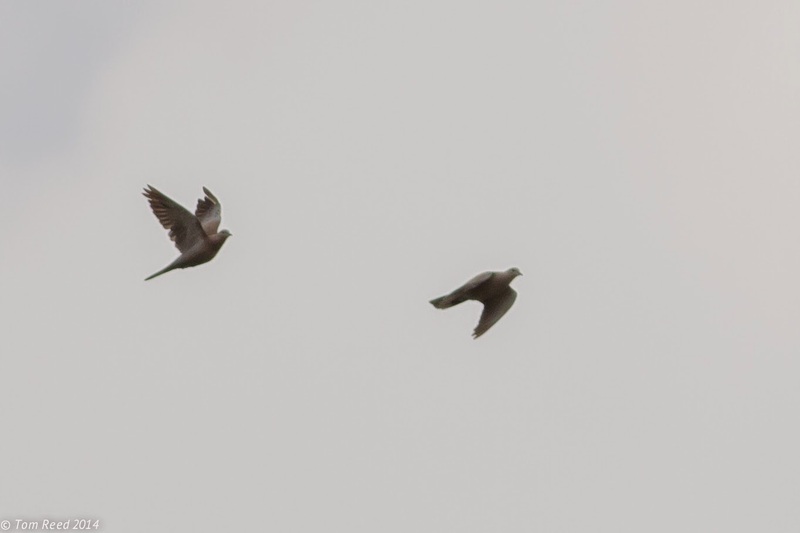 Notable were the 2 Eurasian Collared-Doves that flew over CMPSP 22 Aug (TR, MiC). This is the first time more than 1 individual had been reported at Cape Island since early-Feb. A Common Nighthawk was hunting over Dias Creek at dusk 17 Aug (TR). A nice early-morning movement of Ruby-throated Hummingbirds 17 Aug included 33 that buzzed past the Higbee Dike (GD). Passerine migration was limited, save for a small influx that arrived on light northwest winds 18 Aug. Fair numbers of Eastern Kingbirds could be found at HB through the period, with 300–400 individuals present most days (m. ob.). The week's warbler highlight was a Golden-winged at HB 16 Aug (JA). Now is a great time to look for Mourning Warbler-- singles were noted at the Rea Farm/Beanery 16 Aug (RH), HB 18 Aug (MeC, MiC), and near Goshen 22 Aug (DW, JN). Solo Prothonotary Warblers were recorded at the Higbee Dike on 16, 17, 18, and 22 Aug (GD, TR), and Louisiana Waterthrush was noted there 17 and 18 Aug (GD). The season's first Dickcissel made its presence known over the Higbee Dike 17 Aug (GD), before the season's second Lark Sparrow put in a brief appearance at SCMM 20 Aug (SR). Bobolinks have become more apparent at many sites, and the period's high count consisted of 193 at the Higbee Dike 18 Aug (GD). Jesse Amesbury (JA), Tom Baxter (TB), Megan Crewe (MeC), Mike Crewe (MiC), Glen Davis (GD), Matt Garvey (MG), Roger Horn (RH), Corey Husic (CH), Diane Husic (DH), Jon Isacoff (JI), Tom Johnson (TJ), Bob Lubberman (BL), Josh Nemeth (JN), NJDFW (New Jersey Division of Fish & Wildlife staff), Tom Reed (TR), Melissa Roach (MR), Steven Rodan (SR), Clay Sutton (CS), Dustin Welch (DW), Louise Zemaitis (LZ). *eBird. 2012. eBird: An online database of bird distribution and abundance [web application]. eBird, Cornell Lab of Ornithology, Ithaca, New York. Accessed 23 Aug 2014. Available: http://www.ebird.org. The forecast doesn't look great for scholars of East Coast bird migration right now, with a predominance of light and variable winds mostly showing an easterly element. However, though Cape May birding is largely about migration at this time of year, it isn't entirely so. This has been borne out over the past few evenings with a number of us taking time out from migration studies to go and count some pretty impressive gatherings of herons and egrets out in the back bays. Tom Reed has been leading efforts to count numbers of birds at a particularly large roost north of Stone Harbor and doubtless he will reveal some of the results in his weekly round-up in a couple of days time. So, if you are in town and missing out on migrants, what can you be looking for? Well, there's plenty of opportunity to take a boat trip and get closer to waterbirds; Clapper Rails continue to show consistently and well, and an American Avocet was reported yesterday out in the creeks. Ospreys with young feature strongly and I hear that a pair of Bald Eagles are feeding a fledged youngster and delighting a number of our boat trip groups. Mid-August is also a classic time to take a walk with us at Higbee Beach, for now is the time that Eastern Kingbirds collect there in large, pre-migratory staging flocks - so far, some 300 or so birds seem to be present and feeding well on Black Cherries, which have had a good fruiting year this year. can locate during the course of the event. When bird movements are quiet at the point, you can usually count on the back bays to provide you with some good birding; this American Avocet was seen from the Osprey boat trip recently and may perhaps be the bird that had been seen several times at The Meadows recently [photo by Warren Cairo]. Whether you are 9 or 90, birding is a great hobby and instills in many a greater knowledge and understanding of the needs of other species. From there the best decisions to protect our environment and, ultimately, our own future can be made, based on sound knowledge and proven facts. 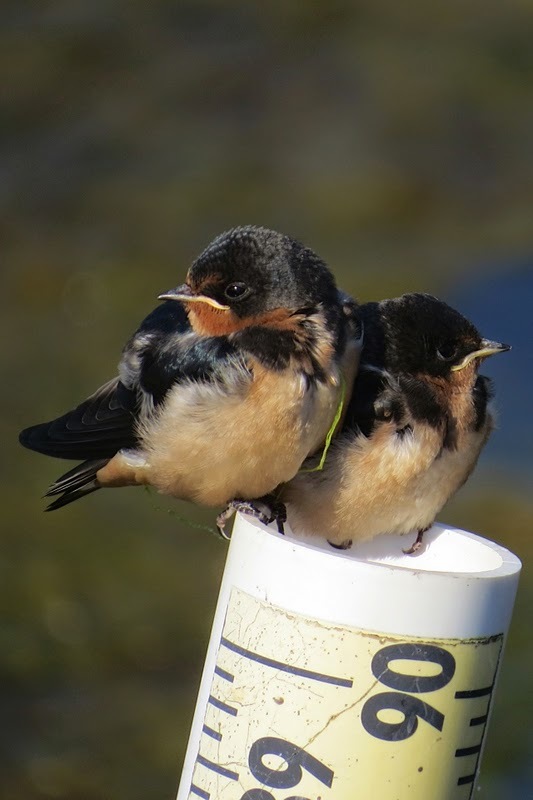 These two Barn Swallows have just recently fledged from TNC's South Cape May Meadows - it's time for all of us to fledge a friend - come and join us at the state park on Friday [photo by Warren Cairo]. Approximately 100 Black Scoters, and at least 2 Surf Scoters, continued their stay at CMP through the period (m. ob.). Wilson's Storm-Petrel reports continued to diminish, but a handful were seen during ferry crossings (m. ob.). The fall's first Green-winged Teal appeared at CMPSP 14 Aug (TR). 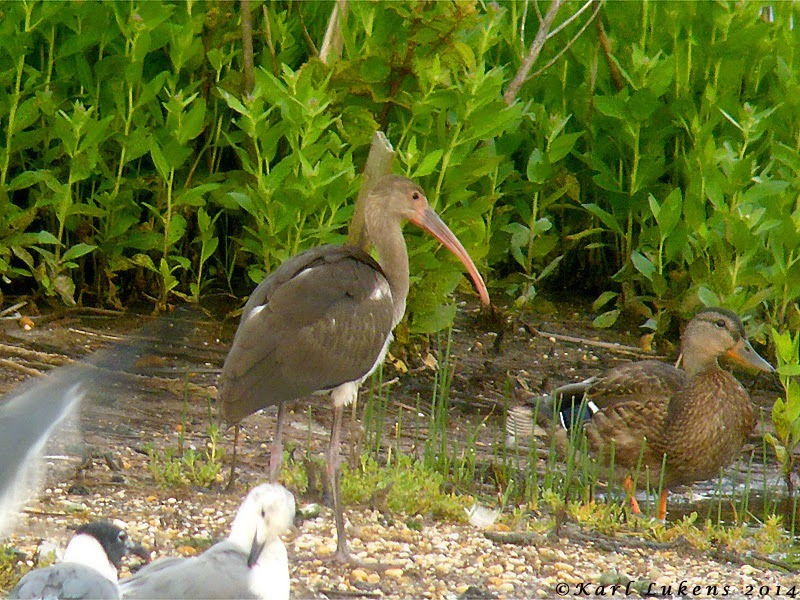 A juvenile White Ibis was seen at the Cox Hall Creek marsh, along Clubhouse Drive in Town Bank, 12 Aug (TM, m. ob.). There have been no reports since. Westerly winds brought a Broad-winged Hawk over SCMM 15 Aug (VE). The season's 7th American Avocet was found at SCMM 14 Aug and continued through 15 Aug (RT, m. ob.). An Upland Sandpiper made for a surprising sight on the west path of SCMM 15 Aug (VE). A strong movement of shorebirds followed heavy rain associated with a cold frontal passage 13 Aug. This flight was easiest to observe at Cape Island, where 550 Lesser Yellowlegs and 120 Stilt Sandpipers flew south past SCMM during the AM hours (MO'B, m. ob.). Multiple American Golden-Plovers were noted after the storm at Cape May Airport 13 Aug (JN, BB), and 2 were seen over West Cape May 14 Aug (MO'B). Several observers sent along reports of White-rumped Sandpiper in recent days, including multiple sightings at SCMM. Mid-August can be a good time to find Marbled Godwit-- a group of 4 dropped in at SHPt 13 Aug (EH). SHPt was also home to 600 Sanderlings and 9 Lesser Black-backed Gulls 14 Aug (m. ob.). Black Terns became more obvious during the second half of the period, with sightings logged at SHPt, SCMM, and CMP (m. ob.). The SCMM beachfront was home to a pair of Sandwich Terns 15 Aug (VE). A White-winged Dove put in a brief appearance at SCMM 11 Aug (m. ob.). It was last seen flying off toward West Cape May and has not been reported again. CMP's Eurasian Collared-Dove was last noticed near the corner of Lehigh & Lincoln Avenues 14 Aug (EO). Single Olive-sided Flycatchers were noted at HB (MeC, MiC) and CMPSP (m. ob.) 14 Aug. 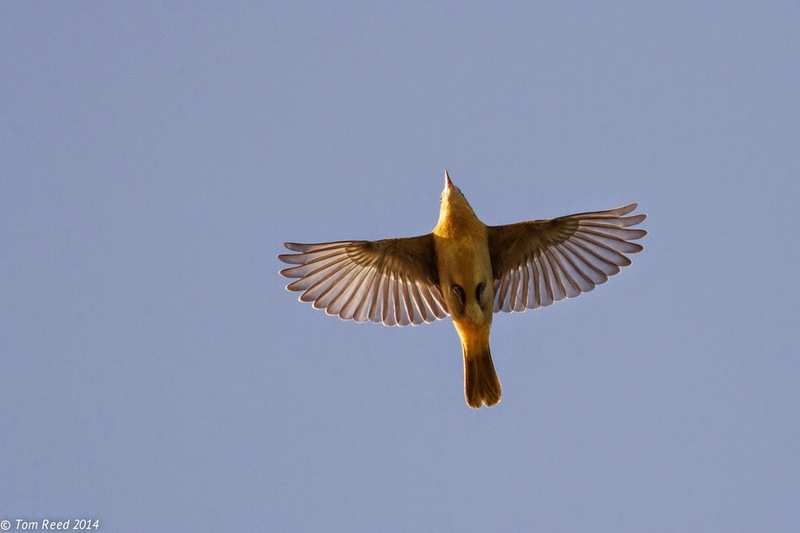 The season's first big push of songbird migrants arrived 14–15 Aug, on the heels of the cold front. Observers stationed atop the Higbee Dike tallied ~400 Eastern Kingbirds, 5 Louisiana Waterthrushes, 190 Northern Waterthrushes, 625 American Redstarts, 2 Cerulean Warblers, 365 Yellow Warblers, and 380 Bobolinks on the move during the early-morning hours 14 Aug (TJ, MG). Passerine arrivals at Cape Island included Yellow-bellied Flycatcher 10 Aug (MJ), Bay-breasted Warbler and Blackburnian Warbler 14 Aug (m. ob. ), and Alder Flycatcher 15 Aug (NP). Other notables included a Golden-winged Warbler at HB 15 Aug (CB, m. ob.) and a Mourning Warbler at SCMM the same day (TR). Lastly, an adult Lark Sparrow was a splendid find at the Rea Farm/Beanery 9 Aug (m. ob.). Bill Boyle (BB), Catherine Busch (CB), Megan Crewe (MeC), Mike Crewe (MiC), Vince Elia (VE), Matt Garvey (MG), Emily Heiser (EH), Matt Jewel (MJ), Tom Johnson (TJ), Tom McParland (TM), Josh Nemeth (JN), Michael O'Brien (MO'B), Emelia Oleson (EO), Nick Pulcinella (NP), Tom Reed (TR), Robert Templeton (RT). *eBird. 2012. eBird: An online database of bird distribution and abundance [web application]. eBird, Cornell Lab of Ornithology, Ithaca, New York. Accessed 15 Aug 2014. Available: http://www.ebird.org. However, it all turned out good this morning. The annoying thing about Cape May (I know, I know, even paradise has problems!) is that there are always choices to be made when it comes to where to head for first thing in the morning; the dune line at the point can be excellent in the right conditions, as can Sunset Beach, and Higbee Beach. Then at Higbee's, do you go to the fields or the dike? Tom Reed tells me that the point was pretty quiet today, so I did make the right decision in heading for the fields - but the dike was pretty impressive too I hear. Overall, Higbee Beach provided some great early-season birding this morning, with exciting movements of Red-winged Blackbirds, Cedar Waxwings, Bobolinks and Eastern Kingbirds. The latter species is building up nicely in the fields too (a traditional staging area, where the birds are currently feeding on this year's bumper crop of Black Cherries) and we saw around 150 Easterm Kingbirds today - though the wheeling around of the main flock made accurate assessments tricky. In the fields, Yellow Warblers, American Redstarts and Indigo Buntings seemed to be the main species on the move, but there were Black-and-white Warblers too, a handful of Common Yellowthroats and a few Worm-eating Warblers. Our first juvenile Chestnut-sided Warbler of the season was nice to see and David La Puma later reported a Blackburnian Warbler from the parking lot. Flycatchers usually feature early in the season and create headaches for most of us as they really are just too darned similar to each other for comfort. A probable Willow Flycatcher toyed for our attention for some time, but a nicely teed up Olive-sided Flycatcher gave no such problems. If you missed this morning's activity, tomorrow morning looks promising too, as north-west winds are forecast to last another 24 hours. If you want some help and guidance with your migrants, or just some good company, join our CMBO walk which departs the Higbee Beach parking lot at 7AM tomorrow morning (easily found at the dead-end, western end of New England Road, just south of Cape May Canal - see you there! Arrrg, a Fall Flycatcher!! Many of the flycatchers seem impossible to deal with in the fall but, with some species, there is hope - don't give up too soon!! This Olive-sided Flycatcher was found by my wife this morning and there is much about it that helped us to identify it pretty quickly. Olive-sided is not one of those hideous Empidonax flycatchers, it's a Contopus - which immediately offers us hope! Start by ignoring the detail and look at the outline of this bird; look how disproportionately big the head and bill look and how short the tail appears - all good Olive-sided clues. When it comes to plumage, notice the dark marks on the undertail coverts, but note especially the smudgy, dark breast sides. These are classic Olive-sided features; many books mention the appearance of a dark vest, but I think of the dark chest of an Olive-side Flycatcher like this; imagine a car mechanic working on a car with oily hands; the phone rings, he needs to answer it - where does he wipe his hands? Down his chest! And the greasy finger marks are streak, not evenly dusky like the pattern on the chest of an Eastern Wood Pewee. One final clue to the identity of this bird - notice how it is sitting right up against the sky, atop a dead snag - classic Olive-sided Flycatcher behavior [photos by Mike Crewe]. With Northwest winds forecast to last all night tonight, it might just be time to think about heading for Cape May Point tomorrow. The first songbirds of fall have been trickling through over the past few days, but a push of northwesterlies may well speed this trickle up. A period of winds with a southerly element has seen an exciting movement of shorebirds today, with Michael O'Brien's shorebird workshop logging 550 Lesser Yellowlegs and 150 Stilt Sandpipers this morning, while our Wednesday morning walk also recorded a great shorebird passage. A juvenile Black Tern off Sunset Beach was the first juvenile of the year for me, with two also noted from St Peter's. Keep an eye on the weather forecast and prepare for at least a couple of days of potentially exciting birding. The weekend sees a return to southwesterlies so it may be worth switching back to shorebirds - hopefully, the next three days of forecast sunny weather will drop water levels again. Recent very heavy rain pushed a lot of birds out temporarily and I hear that even Bombay Hook is struggling to hold birds, as roosting shorebirds head to nearby farmland at high tides. Terns continue to delight our walk groups on the Cape May beaches, giving ample opportunity for us to study different species side by side. Walk volunteer extraordinaire, Karl Lukens, has kindly labelled a few birds here to show an interesting array of birds of different ages [photo by Karl Lukens]. Right on queue - our first surprise songbird of August came on our very first Saturday Rea Farm walk of the season. This Lark Sparrow spent the morning feeding on grass seeds along the crop rows and stayed long enough for a few people to enjoy this western species that continues to increase in number on the east coast [photo by Mike Crewe]. When something crunched under Sam Galick’s shoe as he stepped out his back door a few weeks ago, he assumed it was a twig that had fallen onto the deck. He certainly wasn’t expecting to lift his foot and see North America’s biggest beetle crawling away, quite unharmed. And when I say big, I mean big – the Eastern Hercules Beetle is more than two inches long. It turns out that Sam’s beetle was a female, drawn to the lights on his porch. As you can see in the above photo, she’s olive green and sprinkled with irregular black spots. A male would have been even bigger – though not by much – with a pair of horns at the front, one that curves up from the head and a second even longer one that curves down from the pronotum (the segment of the body behind the head) to meet it. Despite their somewhat scary appearance, the beetles are not dangerous and not known to bite; certainly Sam and his roommate handled this one repeatedly with no bad experiences. Although the beetle is quite widespread in forests throughout the east, ranging from New York state to Florida, and west to southern Illinois, western Arkansas and eastern Texas, it isn’t easy to see, as it spends most of its life underground. Females lay their eggs directly in the soil. At 3/16 of an inch (5 mm), these shiny, white eggs are huge for an insect. The eggs hatch roughly a month after they’re laid, and the white grubs live underground, feeding on decaying plant material. For males in particular, finding a good food source is important; the better their nutrition levels as larvae, the longer their horns are! Often, the larvae move from the soil up into rotting tree stumps, feeding on the decaying heartwood; they never attack living trees. After 6-12 months of stuffing themselves, the larvae pupate, emerging a few weeks later as adults. Even then though, they remain underground, waiting until spring to venture forth. Males seek out ash trees and make “sapping spots” on the branches, using their long horns to shove rival males away from the food sources. The sap attracts females too, which use pheromones to attract males for mating. While most of us are unlikely to be as lucky as Sam in finding an adult Eastern Hercules Beetle, it is possible you might come across a larva lurking in the earth as you dig in your garden. Keep an eye out for a very big C-shaped grub! Location Abbreviations/Explanations: CMP (town of Cape May Point), CMPSP (Cape May Pt. State Park), SCMM (South Cape May Meadows). An unseasonably large group of Black Scoters, likely still numbering over 100 individuals, remained at CMP through the period (m. ob.). At least 4 Surf Scoters could also be found with this group at times (m. ob.). Gadwall remained a regular sight at CMPSP and SCMM; a recent high count of 13 was obtained at CMPSP on 6 Aug (m. ob.). Wild Turkey reports included a group of 8 near the corner of New England & Bayshore Roads 4 Aug (MeC), and a female leading 2 young birds along Lighthouse Avenue, CMP 8 Aug (TR). Wilson's Storm-Petrels are becoming less regular from shore, as often happens after mid-Jul. This week's only land-based reports were all of single birds, viewed from CMP 3 Aug (MS) and 8 Aug (TR). A whale-watching trip produced 15 Wilson's Storm-Petrels on 4 Aug (DL). A Cattle Egret flew in off the ocean before it briefly put down at SCMM 4 Aug (VE). A juvenile White Ibis entertained numerous observers at SCMM 3–4 Aug (DF, m. ob.). It was last seen along Stevens Street, West Cape May 4 Aug (m. ob.). Several White Ibises have appeared in the Delaware Valley since mid-Jul, and observers should be on the lookout for this southern stray. Another wanderer from the south was a Wood Stork over CMP 7 Aug (MP, MiC, JS). This individual represents approximately the 12th Cape May County record. A Wood Stork was also reported later the same day, flying over Route 47 near Reed's Beach (WK). There have been no sightings since. Cape Island's first Broad-winged Hawk of the season was noted near the corner of New England & Bayshore Roads 7 Aug (MiC) and more interestingly, a juvenile Red-shouldered Hawk was photographed over Cape Island the same day (AA). Water levels at SCMM and CMPSP have become unfavorable for shorebirds, and most reports during the past week were restricted to fly-over migrants. The county's 6th American Avocet of the season shot past CMPSP 2 Aug (DF et al.). An evening shorebird flight along the Delaware Bayshore included a Hudsonian Godwit and a Long-billed Dowitcher over Reed's Beach 8 Aug (TR). Intriguing were the 2 Pomarine Jaegers spotted from the 2nd Avenue jetty in Cape May City 3 Aug (SR). A Sandwich Tern and a Black Tern put in brief appearances on the CMPSP beachfront 5 Aug (VE), and Royal Tern numbers increased through the week (m. ob.). Approximately 100 Black Skimmers have been noted at Poverty Beach in recent days-- the species is nesting at the site this summer (fide NJDFW). After another lengthy absence, a Eurasian Collared-Dove was seen from SCMM as it flew toward Cape May City 7 Aug (TR). Observers are encouraged to continue reporting any sightings of this species. On the heels of the latest cold front, a couple of Common Nighthawks were observed over CMP 7 Aug (MP), followed by another over Erma 8 Aug (TB). Red-headed Woodpeckers bred in the Green Creek section of Middle Township this year; an adult and two juveniles were noted on private property 4 Aug (TB). Merlins have appeared with increasing frequency during Jul and Aug in recent years-- 2 were ahead of schedule at SCMM 8 Aug (m. ob.). A locally scarce migrant, the season's first Olive-sided Flycatcher was a smidge early at Higbee Beach WMA 7 Aug (VE). The flycatcher was part of a post-frontal songbird movement that also included 50 Blue-gray Gnatcatchers, 100 Yellow Warblers, 55 American Redstarts, 20 Orchard Orioles, and the season's first Chestnut-sided Warbler at Higbee Beach (VE). Additional southbound arrivals at Higbee included Mourning Warbler 4 Aug (MS), Least Flycatcher 7 Aug (VE), and Warbling Vireo 8 Aug (MG). Amar Ayyash (AA), Tom Baxter (TB), Megan Crewe (MeC), Mike Crewe (MiC), Vince Elia (VE), Don Freiday (DF), Mark Garland (MG), Will Kerling (WK), David Lord (DL), Karl Lukens, New Jersey Division of Fish & Wildlife staff (NJDFW), Mike Pasquarello (MP), Tom Reed (TR), Steven Rodan (SR), Jessica Schera (JS), Matt Sharp (MS). *eBird. 2012. eBird: An online database of bird distribution and abundance [web application]. eBird, Cornell Lab of Ornithology, Ithaca, New York. Accessed 8 Aug 2014. Available: http://www.ebird.org.